A new twin-engine jet has been unveiled by Dassault Aviation. The Falcon 6X has a 1,845ft³ (52.2m³) cabin volume (excluding flight deck and baggage areas), the greatest of any Falcon. 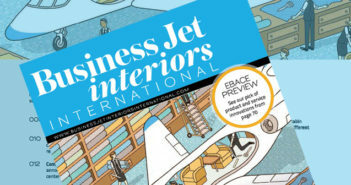 Dassault believes the new aircraft offers the highest and widest cross-section of any purpose-built business jet. The cabin is 6ft 6in (1.98m) high, 8ft 6in (2.58m) wide and nearly 40ft 8in (12.3m) long. It also offers 155ft³ (4.4m³) of baggage space. The Falcon 6X is substantially based on the Falcon 5X’s aerodynamics and features, which have been validated in a preliminary flight test program. The Falcon 6X will offer a greater range – 5,500 nautical miles (10,186km) – and a longer cabin. The greater width enables an aisle that is 5in wider than previous Falcons. The cabin has three lounge areas, accommodating 16 passengers. Floorplan options include room for a large entryway/crew rest area and a rear lounge. 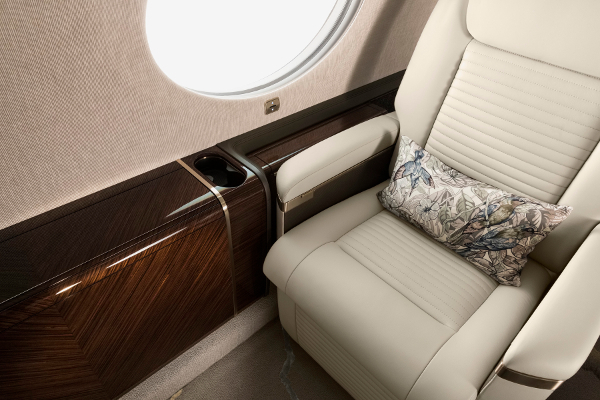 For the new cabin design, the results of a customer survey were combined with input from Dassault Aviation’s in-house design studio. The design prioritizes flowing uninterrupted lines and spaciousness. Natural light was also a consideration, and therefore the aircraft’s windows have a total surface area of nearly 5,000in². As well as 28 “extra-large” windows, there is a skylight in the galley. Cabin air will be refreshed continuously, and cabin altitude pressurization will be maintained at 3,900ft (1,189m) at 41,000ft (12,497m). The Falcon 6X will have a high-speed connectivity system, with service options including Ka-band. Its new IFEC network technology will distribute HD audio and video. It will be possible for cabin functions to be controlled through a mobile app or cabin interface. Dassault plans to use new highly accelerated life tests and stress screening endurance campaigns to validate systems and critical equipment on the ground, extensively. To optimize maintenance once in service, there will be a real-time self-diagnosis system on board. FalconScan will connect to all systems, monitoring more than 100,000 parameters (compared to hundreds on previous Falcons) for faults. As well as detecting faults and troubleshooting on each aircraft, the system will enable Dassault to monitor trends across the global fleet. The aircraft’s top speed is Mach 0.90. Other highlights include Pratt & Whitney Canada’s PurePower PW800 engines, noise suppression systems, a new cockpit and the third-generation EASy III all digital flight deck. The first flight is scheduled for early 2021, with deliveries to start in 2022.